Momma Told Me: Sometimes life's sweetest moments are also messy. When Savannah was pregnant with my youngest nephew, Nathan, she had the worst sort of sweet tooth. I'd hear their truck's engine warming up at 2 am as the entire family would pack into the car and run to the fast food location on the corner for OREO milkshakes and churros. One hot and sweaty SoCal Summer afternoon, just a month out from her due date- I wandered across the street to share in the misery of the heat and dote upon the woman enduing it while carrying another human being inside her. When I arrived all windows and doors were wide open, a common enough scene- but the dining room table was covered in marshmallows and cereal boxes. I asked what on Earth the family was up to as Sabrina (then 11) popped her head out from a very deliberate hunt through the fridge. 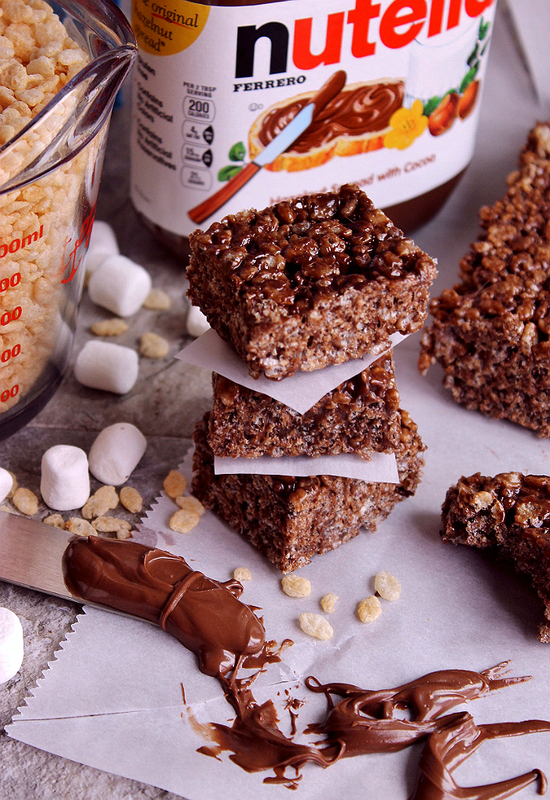 "Cereal treats! I'm craving cereal and marshmallows. I need sugar and crunchy and chewy, I could eat a while bowl!" Slumping into a chair at the overrun dining table I laughed, eyeing the room for the nearest fan as her eyes narrowed and her face dropped in all seriousness, "I need cereal bars now, do you know how to make them?" My laughter grew audible, surely the heat was already melting the necessary ingredients as we spoke- besides, who didn't know how to make cereal bars? That was a question I made the mistake of asking an 8 month old pregnant woman funneling sugar coated marshmallow bits out of a cereal box with her bare hand, "My husband! That's who! He tried to make them in the microwave. He just put the cereal and the marshmallows and the butter all in a giant bowl and nuked it! 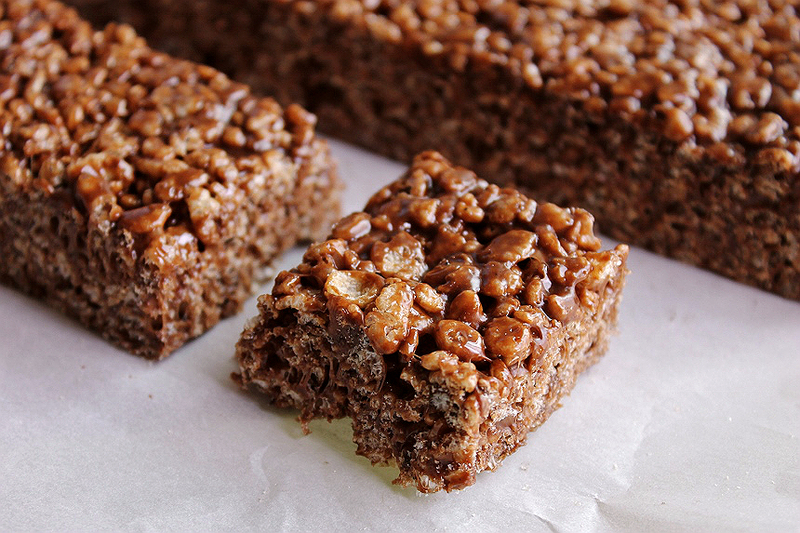 I don't know what in the H-E-double-hockey-sticks that was, but they were NOT cereal bars!" I could see Sabrina now on her phone, frantically trying to pull up a recipe as the reality of the moment set in. This was no joke, it was a pregnancy emergency. Just as my 11 year old niece was about to being rattling off the 3 ingredient recipe in excessively complicated detail I whipped the largest pot out I could find and began melting a stick of butter and a bag of marshmallows. Savannah watched skeptically just over my shoulder, "Are you sure this is going to work? I think you need MORE marshmallows" she questioned. I was about to open my mouth with a snarky remark about how Momma had shown me how to make cereal bars the right way hundreds of times, but I caught the gaze of her broken husband, and a silent nod and thought the better of it. When the marshmallow was a creamy, even, texture I instructed my niece to begin pouring their cereal of choice in- at which point Savannah demanded to lick the spoon. While I'm sure in her mind the delicious lava like river of marshmallow seemed perfectly edible and logical in that moment, I wasn't about to begin arguing why that wasn't going to happen so I motioned to Sabrina for the box of cereal and began pouring. 15 minutes later the house resembled a tornado but an astounding calm had washed over the atmosphere when I heard from the couch, sticky cereal coated spatula in her hand "Needs chocolate." inspired by emergency afternoon cereal bars made for my pregnant sister. 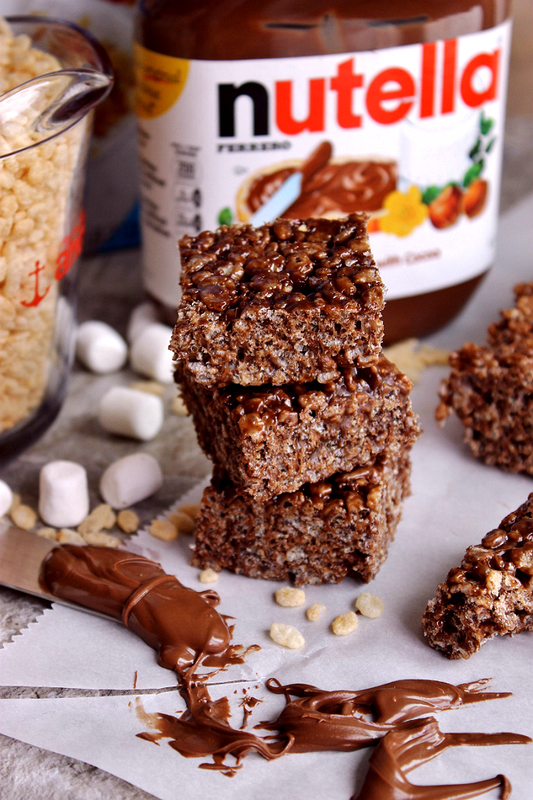 Enjoy these simple Nutella Crisped Cereal Bars with as much chocolate flavor as you want. Like it a little richer? 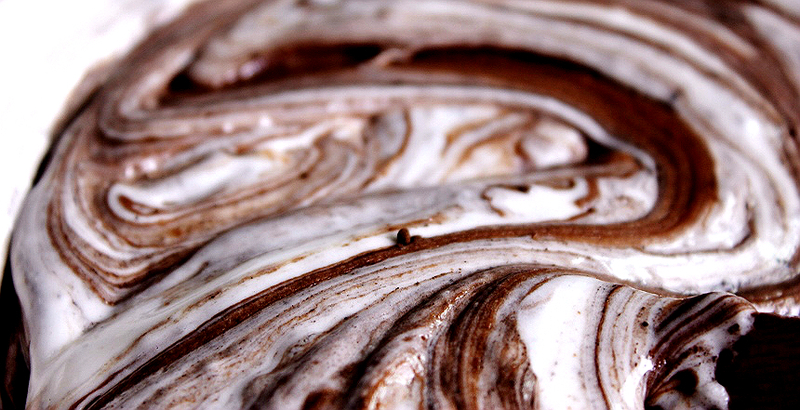 Up the unsweetened cocoa powder. Want a stronger sweetness? 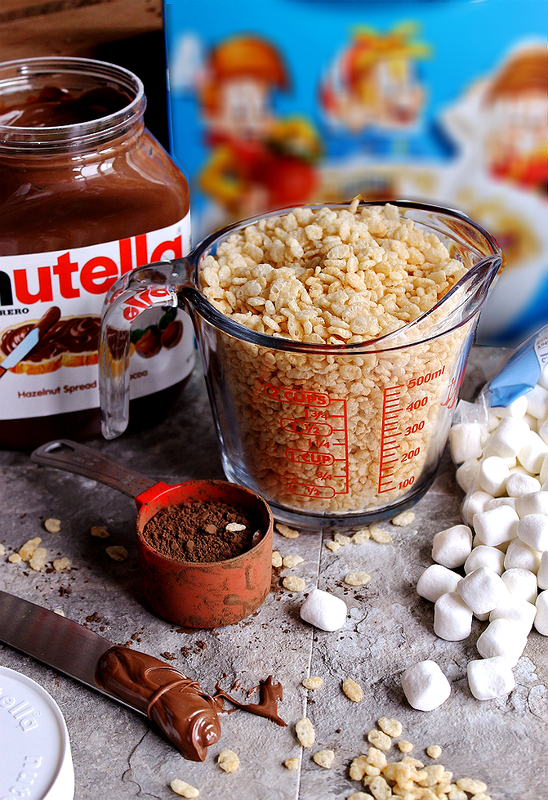 Add some more Nutella. However you whip up this recipe you can't go wrong- just don't throw all the ingredients in the microwave at once. In fact, we recommend the stove top variation. Now, tell me, did you ever make a last minute recipe or dish for yourself or a loved one who was pregnant? What Daughter Says: Some of my favorite memories are also the stickiest. Part of the fun of simple recipes are the people you share them with! 1. Line an 8 x 8 baking dish with parchment paper. 2. 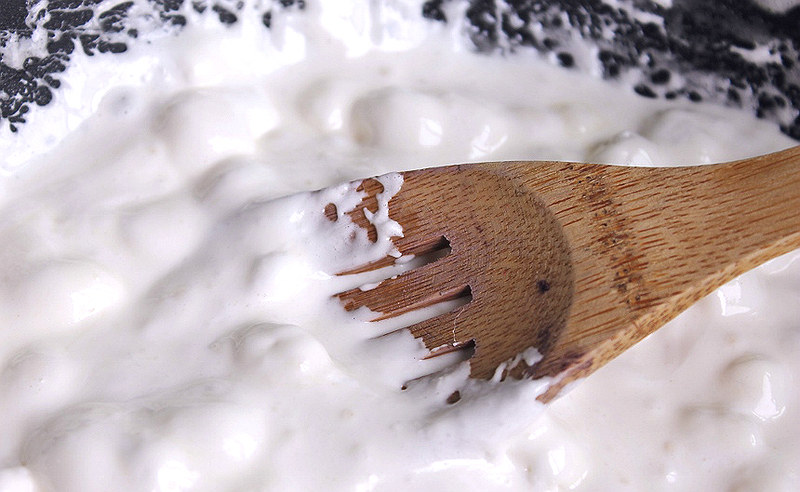 Heat butter in a large pot over medium heat and add marshmallows, stirring constantly until melted and even. 3. 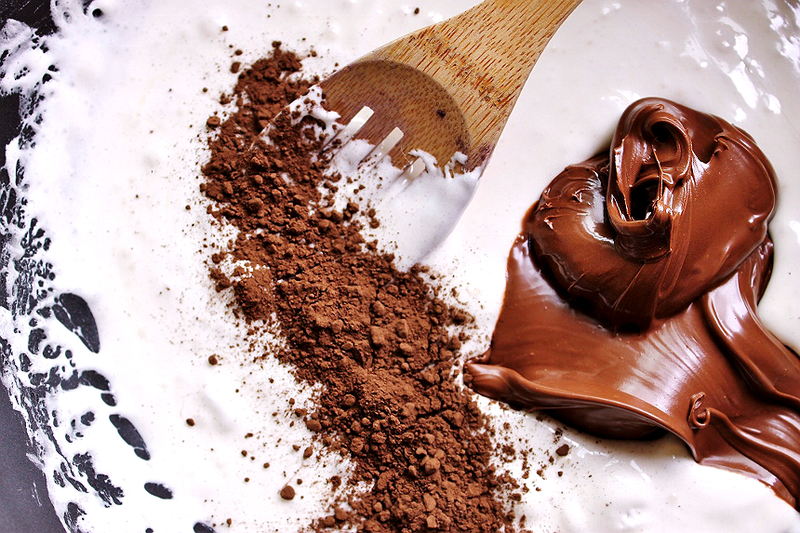 Add the cocoa powder and Nutella and mix well until smooth and creamy. 4. 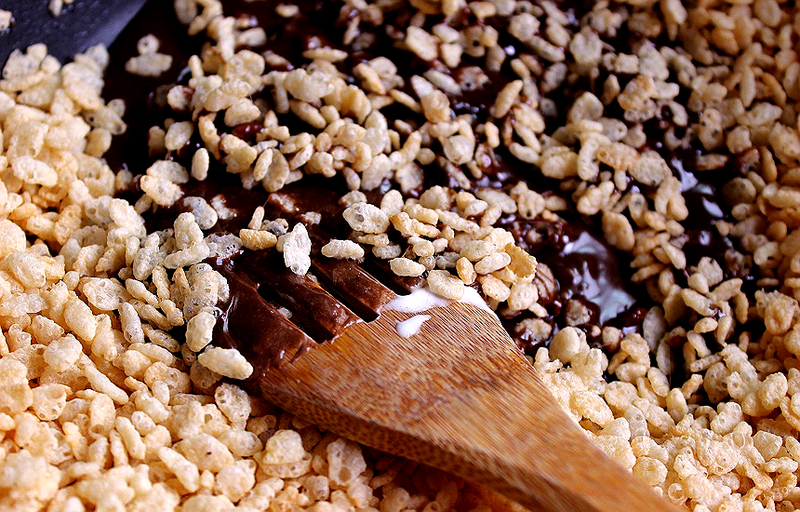 Remove from heat and pour the crispy cereal into the marshmallow mixture and combine with a wooden spoon until evenly coated. 5. 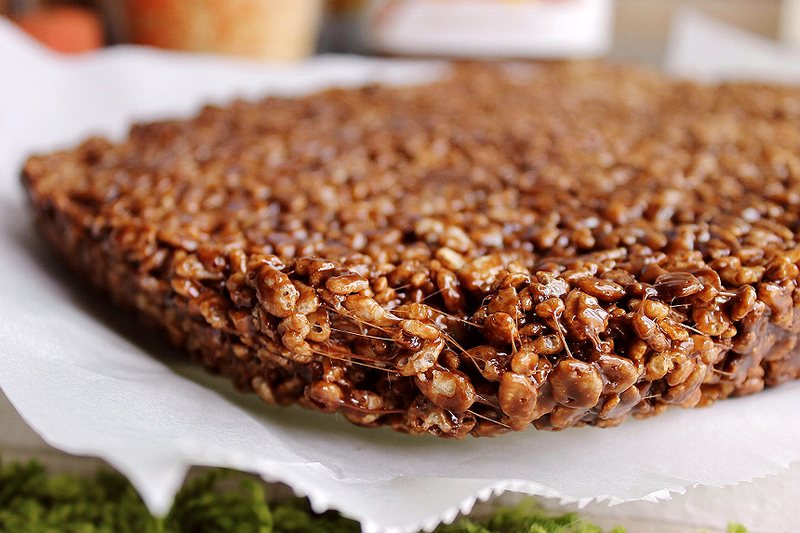 Pour crispy cereal mixture into the parchment lined pan and top with a second sheet of parchment paper. 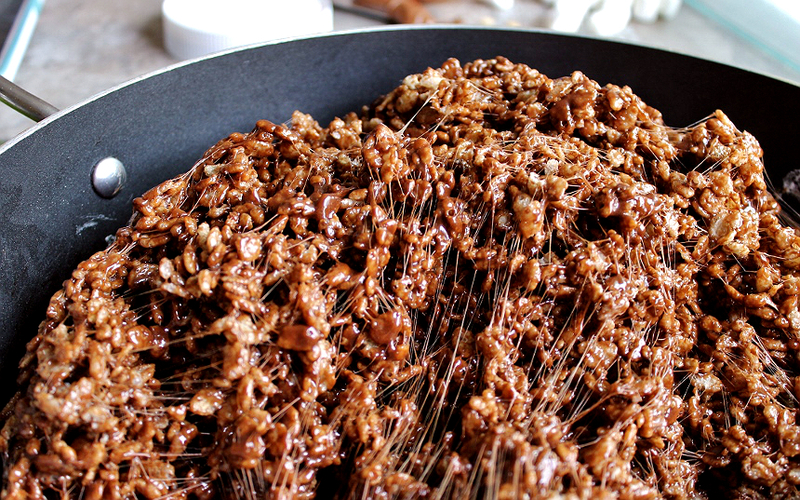 Press down firmly until cereal mixture smooths to edges and is a firm compact brick. 6. Refrigerate for 5-10 minutes or allow to cool to room temperature for 15-20. 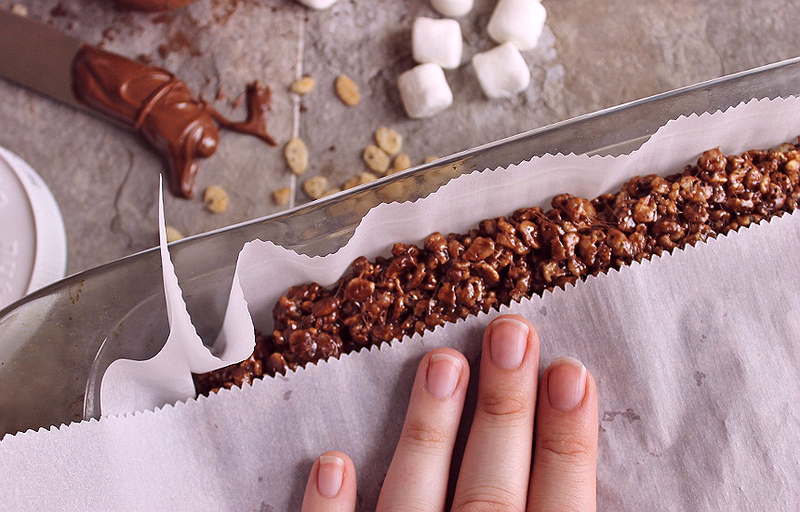 Lift cereal bar block up from baking dish by edges of parchment lining paper and place on solid cutting surface. Cut into even squares about 1.5" in width. great idea!! i never though to do this!! 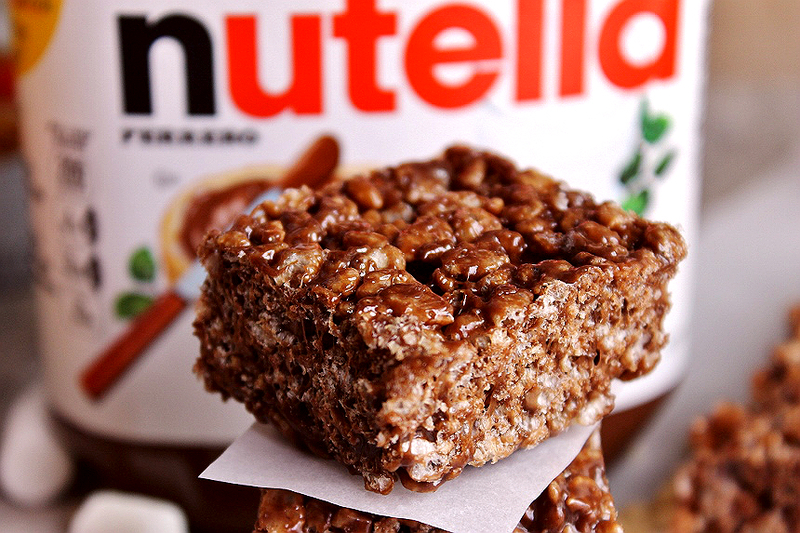 I've never tried this Nutella stuff but everyone keeps raving about it. As to the last minute thing - does the apple pie I made yesterday 'cause I wanted pie count? That does look good. I'm sure the kids would enjoy them for Easter this year too. Those look delicious! I'm going to try and make these soon.